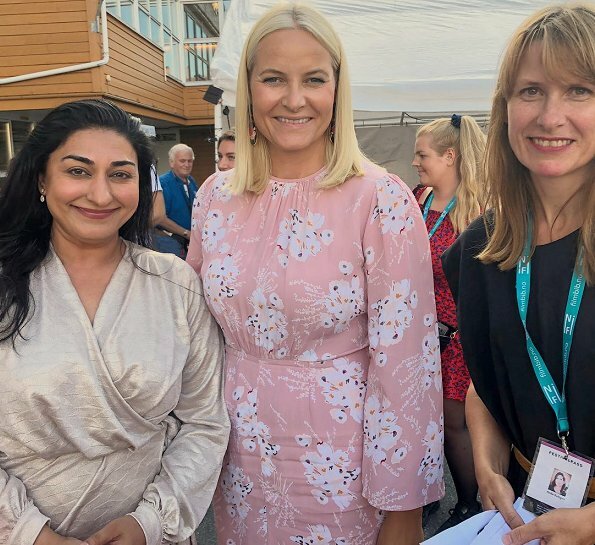 In the evening of June 13, 2018, Crown Princess Mette-Marit attended the opening of the 41st Norwegian Short Film Festival at the Grimstad Cultural Centre (Grimstad kulturhus) in Grimstad. 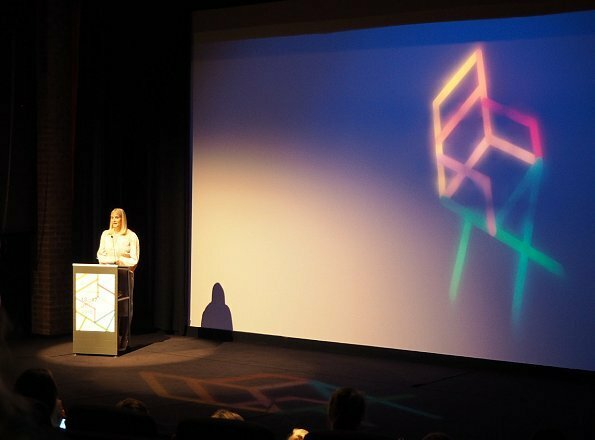 The Norwegian Short Film Festival (Kortfilmfestivalen) is a short film festival with a competition programme for Norwegian and international short film, short documentaries and Norwegian music videos. Big 'Yes' to the pink dress, big 'No' to the red.. smock? the flower-patterned dress in the first pics looks very lovely. But I'm not happy with this red 'dress', that she wears open. It doesn't fit her well. This red dress was never meant to wear it open like a coat. What a misunderstanding of fashion. What a desaster! Why is it called a coat ?? Honestly, I think, it has just been too tight for her, so she has to wear it open. Yes probably, but that is not how a royal princess should choose her outfit, sorry. As a dress it is so nice on the model, as a an open coat it is just inapropriate, whatever the reasons are. 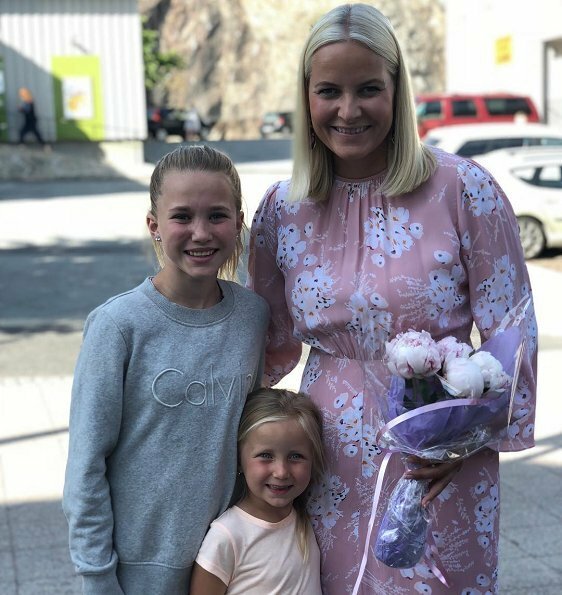 Cute photo of Mette-Marit with the two little girls. I almost jumped out of my chair when I saw her in that red number, which is actually quite nice on the model. Still trying to decide on her marshmallow & cotton-candy dress, although it does fit her better than her usual choices. Nice pink dress but, flattering colour for MM but too tight again. Big NO for the red coat. The pink and white floral dress is very feminine. I do wish MM would get better undergarments though as this spoils the whole look. Her top have looks very matronly. The red one? Oh my goodness!! The coat is nice but it's how she styled it that's the problem. She seems to struggle to put together a look. The first dress is GOOD, fits her well. Lovely design and flattering her. And as I smiled scrolling down, thinking ´now we´re talking´ my smile came to an abrupt halt when that red monstrous thing came up on my screen. It looks acceptable on the model but I can think of a million designs that make more sense than a sleeveless long-vest gone wrap-dress kind of thing. 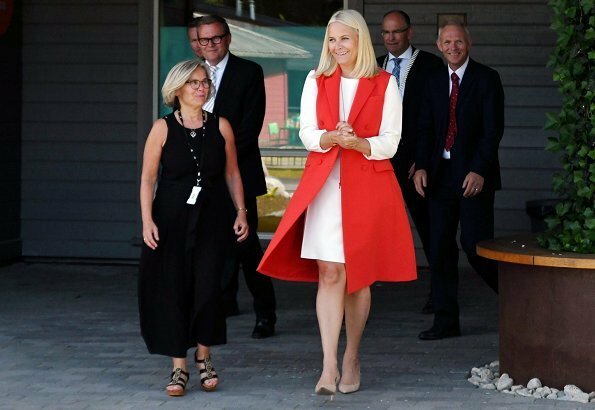 Mette-Marit manages to bring out the worst in it though wearing it like an unbuttoned janitor´s frock. I like the blush pink dress,it seem to fit good too.The red sleeveless coat actually looks good, can be used as dress or coat why not very nice color. Good choice today. MM needs to stop wearing clothes off-the-rack. Sadly, with the typical high fashion designs the sizing does not work for her. She should get a stylist and also consider more bespoke outfits for daytime. I like first dress very much. Lovely colors and good fit. 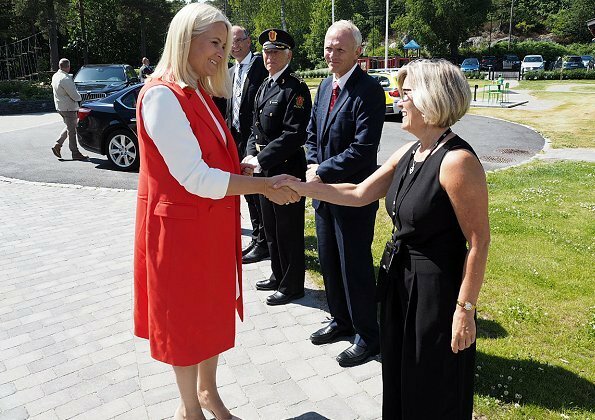 Princess Mette-Marit of Norway looks fabulous. The first dress is lovely and flattering! She looks lovely in the pink dress. She would look good in the red one too, but for the white smock? under it. Bad combination. Strangely enough we have seen Mary in similar long waistcoat also open to great adoration. As soon as we see MM in one she is slaughtered usually by the same people who praised Mary. So what does this really mean...I guess we all know! Pink dress ok,but the red?Awful!I have never seen a grown up wearig such ugly clothes who do not even fit together at all.Where is the clown nose,becouse this is for a circus. this red coat dress?looks very good open over the white dress so this can be wore'n open as she did or as dress both ways it look good.